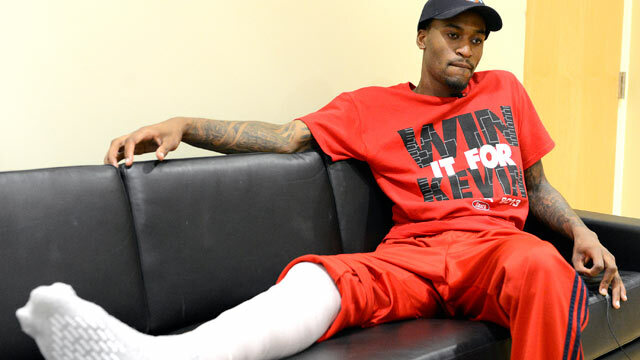 When Kevin Ware crumpled to the floor with a compound fracture during the widely watched NCAA men's basketball tournament, his gruesome injury brought attention to a long-simmering debate about how college athletes, even in elite money-making programs, are vulnerable to incurring healthcare costs that can haunt them long after they graduate. "When you watch Kevin Ware, after you're done cringing, you think, What's going to happen to this guy?" said Ramogi Huma, president of the National College Players Association, an advocacy group for college athletes. Huma says many people watching the game don't realize players aren't guaranteed that all of their medical costs will be covered. And even if they are initially covered, students can later lose their athletic scholarships, and if they then leave the school they would also lose that health care insurance. "People are surprised [the University of Louisville] could have opted to leave him with medical expenses and leave him off the team," said Huma. "The fact that they have that option is outrageous." According to University of Louisville spokesperson Kenny Klein, all of Ware's healthcare costs are currently covered through either healthcare provided by the university or through primary coverage, such as a parent's health plan, although Klein did not have specifics of Ware's plan. Klein also said that Ware was not in any danger of losing his scholarship due to his injury. He could not comment on who would cover Ware's healthcare costs related to the injury after he graduated . Dr. Robert Gotlin, director of Orthopedics and Sports Rehabilitation Program at Beth Israel Hospial in New York, says that Ware's injury is not as catastrophic as it appears. "He's young and if indeed there is no underlying bone or metabolic issue … then this should [likely] heal fine," said Gotlin, who has not worked with Ware. The NCAA requires that players have healthcare coverage to cover athletic-related injuries but it does not specify the degree to which they must be covered for other conditions. During NCAA championships, players who are injured and incur more than $90,000 in healthcare expenses will be covered by the NCAA's catastrophic coverage. That coverage will continue for 24 months or until the student returns to play. According to the NCAA, nearly all Division I schools provide coverage to their athletes and approximately 75 percent of Division II and Division III schools do so. Schools cannot revoke a scholarship based on injury or illness, but many have players on one-year, renewable scholarships that the schools can opt to not renew. In 2010 Joseph Agnew sued the NCAA in an anti-trust suit over the one-year renewable scholarships. Agnew claimed that after undergoing shoulder and ankle surgery, his athletic scholarship at Rice University was not renewed for his senior year. Agnew had to cover the costs of his senior year, according to the suit. David Dranove, health management professor at Northwestern's Kellogg School of Management, says the NCAA should acknowledge that college athletes need more than just the basic coverage available to other students. Currently Dranove says NCAA athletes can only enroll in school health care plans offered to other students, even if the student athletes are at a higher risk for injuries that can require long term or expensive treatments. Schools also have the option to pay medical bills related to an athlete's sport-related injury. "[They] should provide whatever level of insurance [students need] and extend coverage past school," said Dranove. "Right now those costs are being borne by student athletes." In 2011 Valerie Hardrick, the mother of former University of Oklahoma basketball player Kyle Hardrick, testified at a congressional hearing that she was forced to pay out-of-pocket expenses after her insurance company did not cover all of her son's medical care when he was injured during practice. Hardrick says the university refused to pay additional charges related to her son's knee injury. "My insurance does not cover all of Kyle's medical bills," Hardrick said, according to the Associated Press. "The University of Oklahoma refused to pay for Kyle's surgery, his rehab, and his medication." Kyle Hardrick did not have his athletic scholarship renewed and transferred to a community college after his injury. Last year the California State Legislature passed the Student Athlete Bill of Rights that mandated universities, which generated over $10 million in revenue from athletic programs, to cover healthcare premiums for students and pay any deductibles for a student's sports-related injury for up to two years after they leave the university. The universities also have to offer an equivalent scholarship if an athlete loses an athletic scholarship due to injury. Huma hopes that the Student Bill of Rights will be adopted by other states and provide NCAA players with more protection from healthcare bills. Earlier this month the National College Players Association conducted a study in conjunction with Drexel University Sports Management Department that found University of Louisville basketball players had the highest "fairmarket" value, with a single player worth an estimated average $1,632,103. "[It's] not just the idea that players have such gaps in protection," said Huma. "But what they generate in [revenue] and what they don't have in protection is just disgraceful."